Do you love to play card games? Know how to play Phase 10 with your friends for the best fun time. We have elaborated all the Phase 10 rules, phases, instructions, and scoring rules of phase ten card game. Phase 10 is a popular card game created in 1982 on a variant of rummy which can be played with a special deck or two usual deck of cards. Two to six players can play this card game which has ten phases. If you love to play card games on your PC, then you can download phase 10 online for free to have fun during your leisure hours. It is perhaps one of the highest played game yet one of the most complicated one. In order to make it simpler, we have explained all phase 10 rules along with a detailed guide on how to play phase 10 card game. You would surely like to refer our other posts explaining cribbage rules and how to play spades. We are providing the rules and methods of playing all the pop card games like bridge, spades, hearts game, crib, phase 10 and crazy eights. To play Phase ten, you require special deck of cards with total number of 108 card. The deck will include 24 cards of red, orange, green yellow marked from 1 to 12 (in 2 sets), 4 skip cards and 8 wild cards. How To Play Phase 10? The phase ten card game involves combination of cards according to their numbers, colors. One player is selected as a dealer. With each hand the dealer gets alternated towards left side players. The dealer shuffles the deck of the cards and deals ten cards in concealed face down way. One card is dealt at one time to each player. Players can hold their ten cards in hand now to start the play. The remaining deck of the card is placed in the center. Dealer overturns the top card of this remaining deck which is called draw pile and places it beside the draw pile. The player to the left of the dealer starts play by taking either the upturned (discarded pile) card or the top card of the draw pile. The player now chooses a card to discard (discard card is one that should be helping player to make the phase). All the players play in similar fashion of drawing and discarding cards aiming to make the 1st phase. 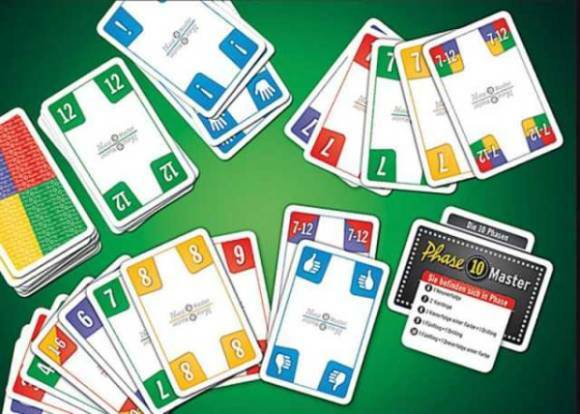 One by one all the phases are played in order of 1 to 10 as pre-phase 10 rules by the players during which they try to keep the cards which help them to complete the current phase and discard the cards to discard pile which will not help them to make the phase. In short, the target is to complete all the 10 phases first. Phase 10 is as popular as rummy card game. It is played by people of all age. However, do go through the Phase 10 rules, instructions and points recording given in our further sections in this post to play the complete card game. The phases are to be completed or played in order. Each player at phase 10 card game can make only a single phase per hand. Keep reading to know the phase 10 rules, scoring and point instructions. The fewer the number of cards left in hand, the better the scores will be. Here are some terms, definitions and phase 10 rules and instructions you need to follow along with the phase 10 rules. A set means two or more cards with the same value or number on its face. A run consists of four or more cards in order of its value or numbers. Skip card – It enables another player to lose the next turn. To play a skip card, you just have to discard the card and keep it in the discard pile. The next player will be skipped. Skipped cards cannot be picked up again once discarded and they are not used a s part of the phase. Flushes – flushes are group of cards of all same colours and can be used as wild cards. Hitting is getting rid of the leftover cards in players’ hands after making a phase. 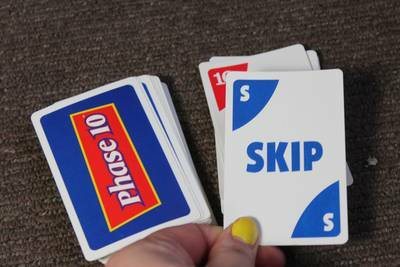 As per phase 10 rules, player can make a hit only after making his own phase. Players can hit a card by laying down a card on the phase made but the hit card should be fitting in with the cards in the phase. For instance a player may make a hit by adding single or more than one card of 4 number to the existing set of 4s in the phase. Card of 2 can be added to the run of 3, 4, 5 and 6. Cards of 7 and 8 can also be added to the run of 3, 4, 5 and 6. Going Out simply means finishing a hand and getting rid of all the cards. A player should try to go out as soon as he finishes the hand by using hitting and discarding. The player who goes out first is the winner of the hand. All players who complete their phase can move on to play next phase. The players who can’t complete the phase get struck on the particular phase only. Player who completes 10th phase, is the winner. If more than one player complete phase 10, the player with the lowest total scores is the winner of the game. Get ready with the deck of your cards and enjoy phase 10 with your buddies competing the 10 fun-filled phases. Do you also play bridge, cribbage and spades? You will the rules of many other exciting card games here. Go through the rules of the card games and methods of how to play them to steal best fun moments with the brain-teasing games of numbers and luck. There are many other interesting games like chess game is also available to play. If you want to take your expertise to the next level you can try online casino card games and earn some money. Learn the rules of chess before you play this mind exercising game. Surely you are now all laced to play the phase ten with all the details of phase 10 rules, phase 10 phases and understanding on its terms. Stay with us for more interesting card games and rules.